First of all, apologies for the lack of posts at the minute. I’ve been a busy girl, and will be in the next couple of weeks too! I’ve managed to get a few jobs styling shoots which is taking up a lot of my time what with all the sourcing of clothing, accessories and props etc, but it will be worth it in the end when I get some lovely photos for my portfolio! The ‘Week In My Wardrobe’ post is being postponed until Sunday or Monday, and you’ll get two weeks worth of pictures in one. Don’t worry, I’ve not forgot! So, onto the Style Crush! Today I’ve chosen Mollie King from gorgeous all girl group, ‘The Saturdays’. Usually, I find her style a little predictable and very ‘High Street’. I praise the fact that she wears accessible, affordable brands, but I think all of the band can tend to look really obviously styled, and very ‘samey’. However, this look is completely different for her. Its really laid back and relaxed, yet chic and grown up. 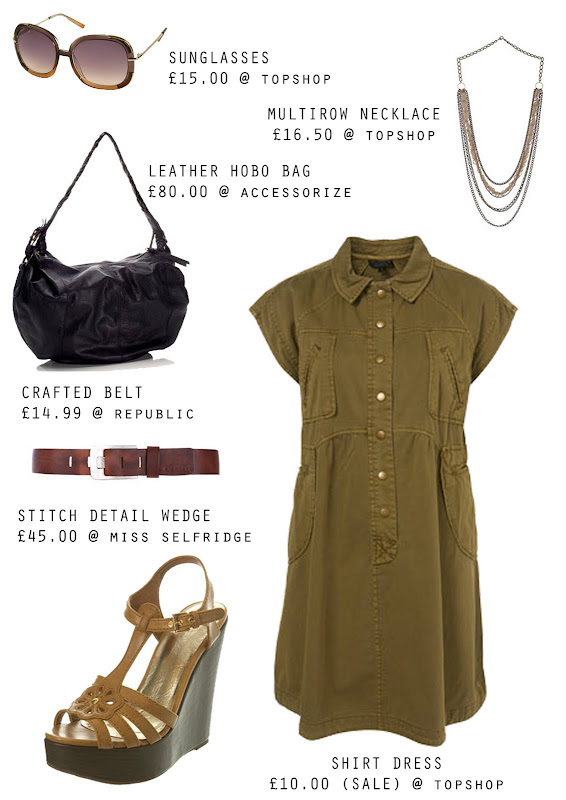 I love the shirt dress teamed with big sunnies and wedges, in classic beige and tan. A gorgeous ensemble in my opinion! Finished off with some delicate long chains and a slouchy bag, this look is perfect for every day, yet smart enough for work or a meal out. Very versatile! Here’s my take on Mollie’s outfit. Hope you like! Products shown were found at Tophsop, Miss Selfridge, Republic and Accessorize. Let me know what you think of Mollie’s more demure look, and if there’s anyone you’d like to see me use in my next ‘Style Crush’ post! I really love her style, but i think I may prefer your version a tad! Can't believe that dress was just £10! I love Florence Welch, so maybe you could do her next? Love the feature and totally adore Mollies style!